Telcon utilizes the latest in metal cutting technology and processing. 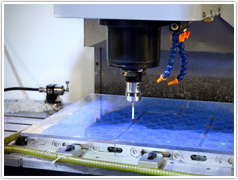 Our CNC machining department currently operates 24 CNC machine tools. Process technologies combined with cellular floor plan layouts, lean manufacturing principles and a motivated work force drives down direct labor costs. Our systems enable our planners and customer service personnel to obtain real-time data from the manufacturing floor, ensuring the highest level of service and response to our customers. Our facility is well kept and organized, and our systems and management team is adept at managing a high mix, low volume operation. Five-axis capability, pallet changers, fourth axis rotary tables, custom fixturing, vacuum chucks and the latest technology in cutting tools are utilized throughout our facility. Touch probes enable adaptive machining and in process part verification. We have extensive experience machining large scale castings and weldments as well as small intricate components. Many of our machined components are later utilized by our assembly department for installation in top level assemblies.